Sometimes a graphic can make the obvious even more obvious. Anyone watching last night knows that Cliff Lee did not look like the guy who took the Rays and the Yankees to school. A look at his pitch plots makes the reason clear. There is that one conspicuous cutter sitting dead center, but nothing else comes even close to it. You see, for the most part, cutters in the bottom half of the zone, change-ups low and away to righties, and curveballs low in or below the zone. If you happen to find someone with baseball savvy who had not watched this game and showed him this strike zone plot, he’d probably be able to tell you that the pitcher had great success. There are a number of concerning aspects of last night’s strike zone plot, not least of which is the number of pitches near the center of the zone. The top-right portion of the plot is also concerning. As you can see, those four curveballs had no chance. Just three of the 11 curves he threw were strikes, none swinging, while against the Yankees he threw eight of 16 for strikes, including one swing and miss. Last night he managed just two curveballs low, while he did it consistently against the Yanks. 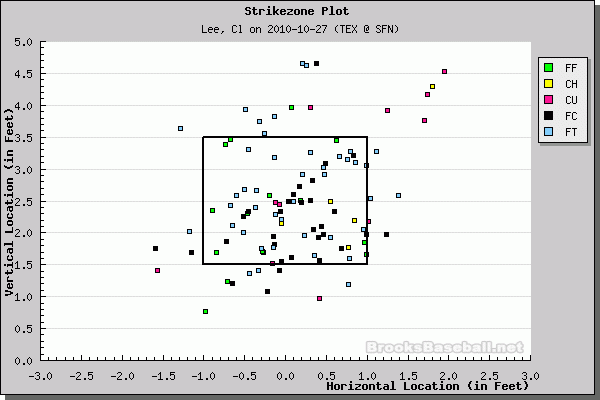 What further hurt Lee was his lack of a changeup. Against the Yankees he threw it 14 times and got nine strikes, three of them swinging. Last night he broke it out just five times, and each time it came early in the count. Three were strikes, but none generated swings and misses. Each time the Giants swung at the change, they put it in play. Finally, the cutter caused him some problems, too. In both games he kept the cutter mostly in the lower half of the zone, but the difference was in how he painted the edges. Against the Yankees you can see the black dots spreading pretty far to each side of the zone. Against the Giants there aren’t many cutters on the outer thirds. The Giants, unsurprisingly, put far more cutters in play, 22.6 percent, than the Yankees did, 15 percent, even though they whiffed more (16.1 percent to 10 percent). No pitcher, not even Cliff Lee, can be perfect every time. After three incredible postseason starts, he finally had a game where he didn’t have complete control of his pitches. Sometimes aces can gut through starts like that. Other times they’re going to get hit around. The Giants had their moment in Game 1, but unless they can complete the sweep this won’t be the last they see of Lee. 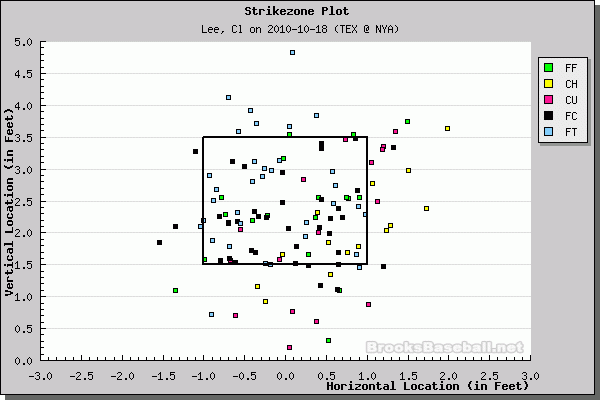 In Game 5 I’d expect Lee’s strike zone plot to more resemble his ALCS start than his first World Series one. We hoped you liked reading Cliff Lee Was Not Living on the Edge by Joe Pawlikowski! With that quote, Marchman redeems himself for the egg he laid on Slate, lol.